The set includes 100 pieces, 1 figure ready for ground mounting. It features an anti-tank and anti-craft artillery gun widely used by Germany throughout World War II and universally known as the Acht-acht ("eight-eight"). 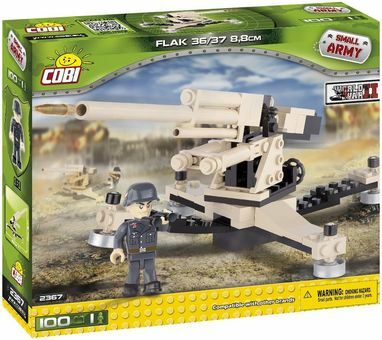 Reinforce your troops with Small Army tanks, planes, helicopters, military trucks or take command of a military battleship and create your own army with COBI blocks.